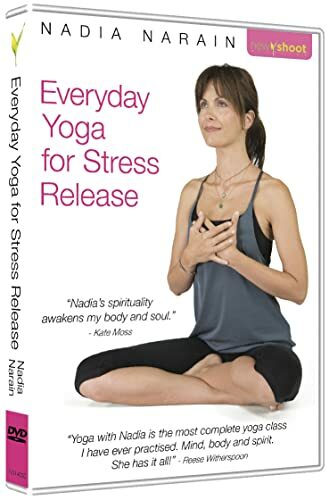 Review of "Everyday Yoga for Stress Release "
This DVD, created by United Kingdom-based instructor Nadia Narain, offers yoga practices to restore a sense of harmony and balance. It inclues three separate "programmes," each with its own unique focus. Programme 1 is a gentler practice for when feeling tired or low on energy; it is more calming and designed to help facilitate sleep. The second programme is a higher energy routine meant to work off tension. Finally, Programme 3 focuses on managing anxiety and other stressful emotions. Narain teaches these practices alone via voiceover in a large exposed brick studio. The routines are listed on the Main Menu as follows: Play All -- Programme 1 -- Programme 2 -- Programme 3 -- Savasana -- Breathing -- Lovingkindness Meditation. I have provided more detail on each of these segments below, including times. This routine is a gentle flowing series. Narain begins seated for a cross-legged forward bend, then comes to kneeling for cat/cow followed by downward-facing dog. Returning to seated, she moves through several arms stretches, such as cow-face arms. The finishing postures include head-to-knee pose, Sage 3 twist, reclined bound angle, and a brief relaxation. This program also starts gently, as Narain moves through the 3-part breath in a seated position. She then performs a seated cat and shoulder stretches. Moving to all fours, she begins a downward dog to plank flow. After resting in child's pose, Narain flows from down dog to crescent lunge and then back to the downward dog to plank flow. This is followed by a variation on lunge salutations, triangle pose, and wide-legged forward bend, including a twist. Coming to lying on her back, Narain moves the legs through windshield wipers and finishes with a very brief (30 seconds) shavasana. This anxiety-relieving routine begins with a seated breath focus. This is followed by cat/cow on the hands and knees and then downward-facing dog. Coming to standing, Narain shakes out the body, shaking the wrists in particular and adding optional small hops. She also adds in several neck stretches. She moves through several sun breaths and then performs a full vinyasa to transition to the floor, where she engages in a jaw massage and a bridge flow. This is followed by two variations of reclined twist, reclined bound angle with a knee hover, and about one minute of shavasana. Narain concludes with a minute of alternate nostril breathing. This is a longer, separately chaptered shavasana. Narain offers a guided body scan to facilitate the relaxation. In this short segment, Narain offers additional instruction in the three-part breath. This is a classic lovingkindness meditation in which Narain guides a meditation focus on someone you love, self, and all beings. This DVD provides three very nice, fairly gentle yoga routines that are certainly likely to be beneficial in managing stress and anxiety. The practices are somewhat indistinct from one another--e.g., they all start in a basic seated position and include many of the same postures--but this is a minor issue. I also would have preferred to have each routine include its own, longer shavasana, as I find having to switch to a separate chapter somewhat distracting rather than relaxing. Overall, however, I would definitely recommend this DVD for stress relief.